When technology meets tradition and creativity meets strong personality the Absolute Navetta family is born. 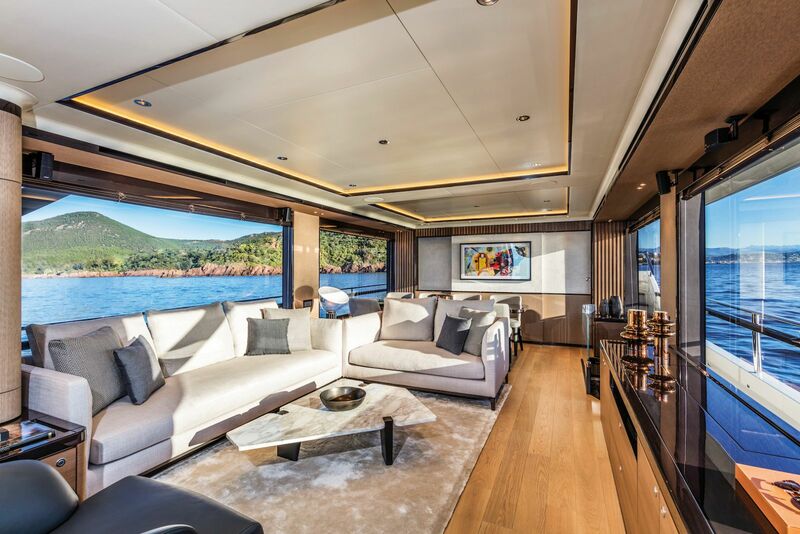 For the Italian company, designing and building some of the most sought-after yachts in the world, it is more of an art form than a job. 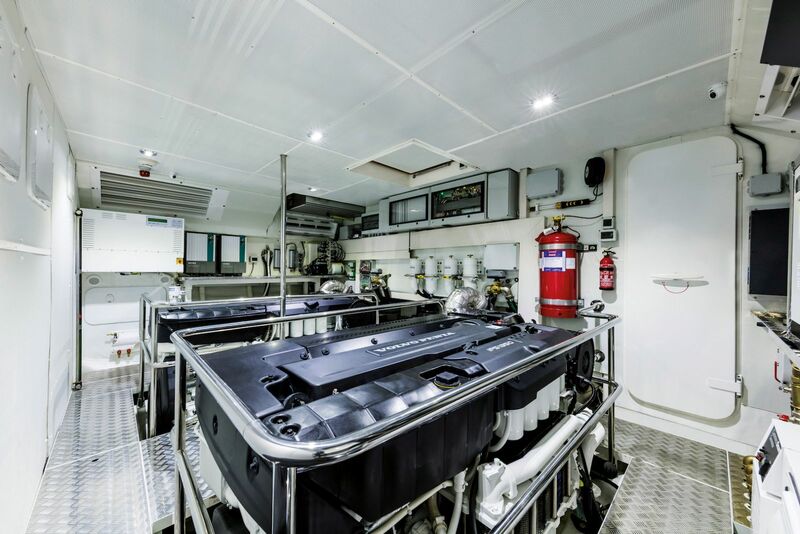 The commitment to excellence and attention to detail can be seen throughout the entire vessel, both inside and out. She gleams with perfection from every angle. 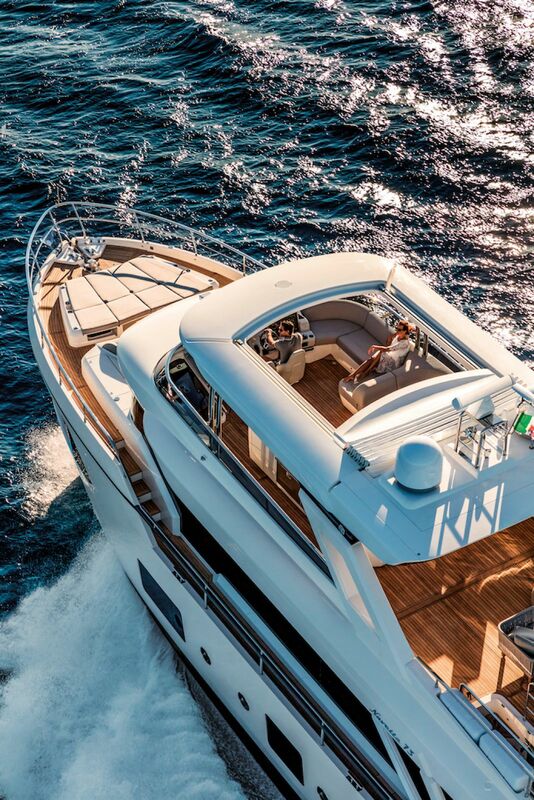 Indeed, Navetta 73 is a unique yacht in her range, which amazes without getting away from the features of the Navetta family, here enhanced through the bigger dimensions. 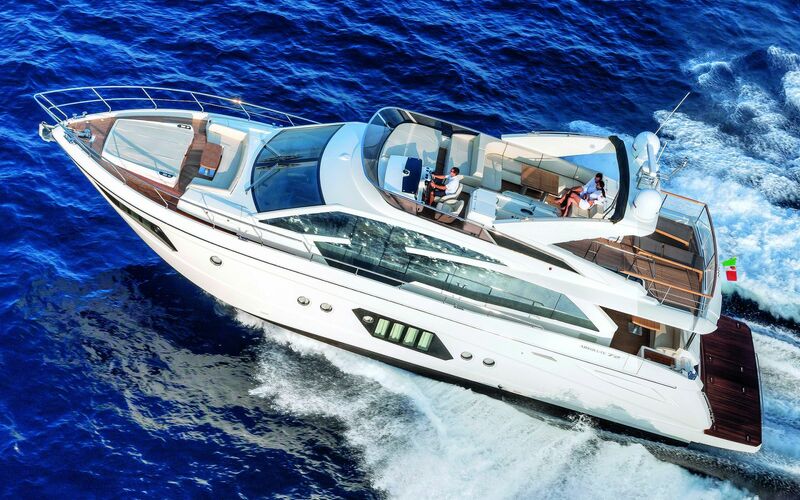 She has more to offer than most yachts in the 80 feet range, but at a 70-foot yacht budget. 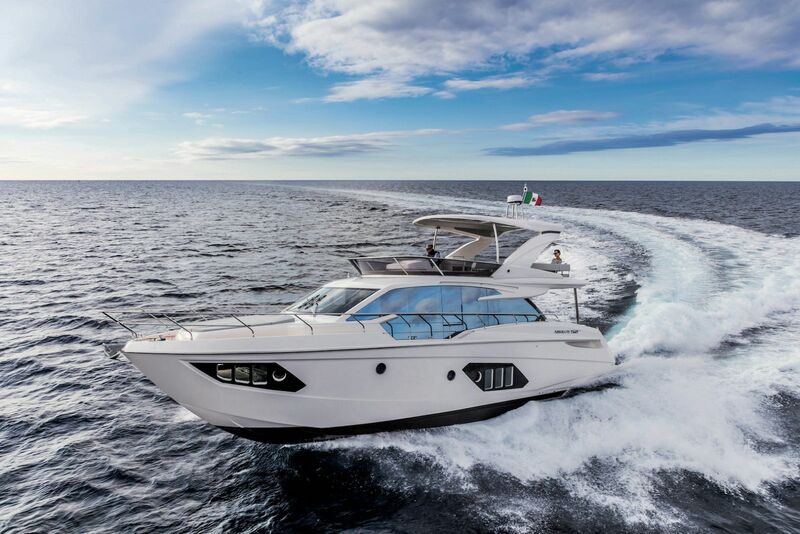 This rare gem is a dream come true for those sea lovers who respect functionality, new technology, most refined elegance and the highest level of comfort. As you are walking up the dock and you see her and all her massive glory, the worries seem to fade into thoughts of adventure, splendor and happiness. 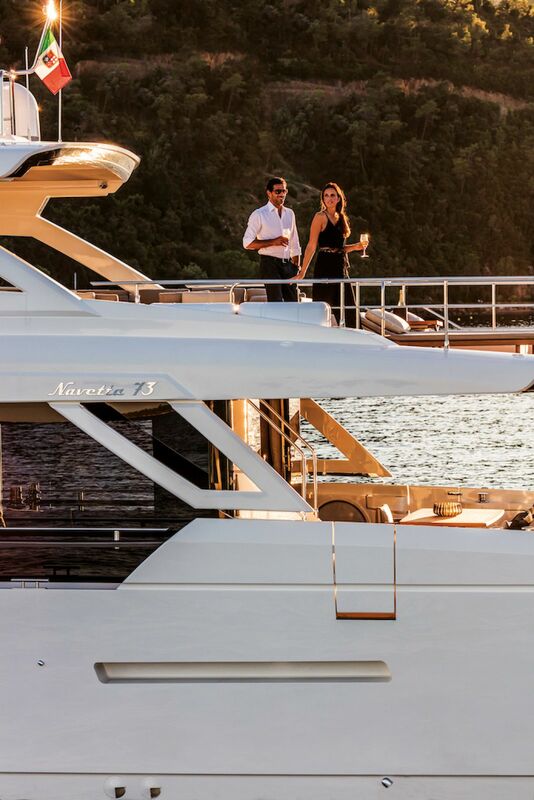 The only limit on the opportunities with the Absolute 73 Navetta is the limit on the mind of the beholder. 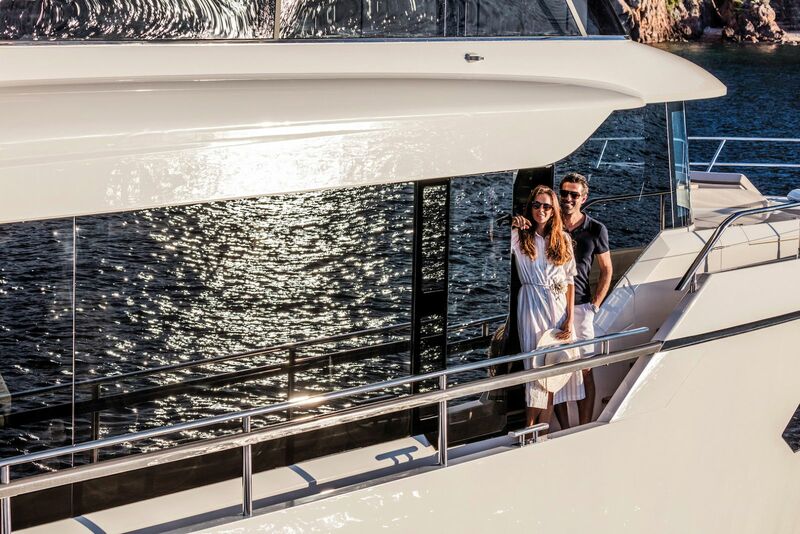 A sunset cruise while sipping the finest of champagne and wine leads to a better view than the most beautifully brushed canvas in all of the land. 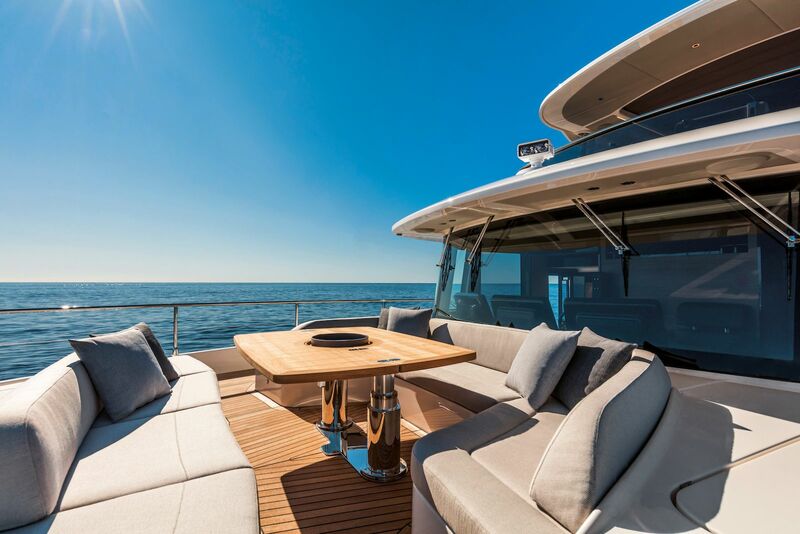 The simplicity of the 73 Navetta adds to the elegance portrayed not only while at sea but also still on the hook or dock. Minimalistic window design provides an abundance of natural light while adding to that elegance. 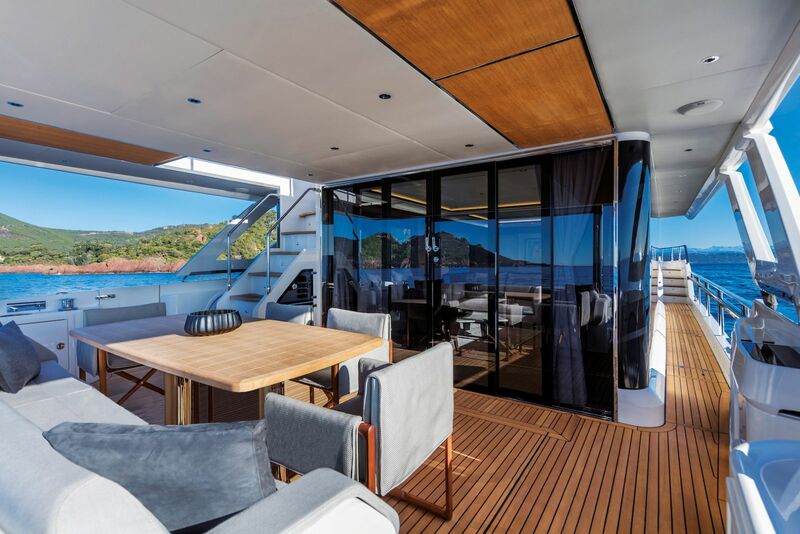 Beautifully shaped, extra-large panes of glass surround nearly the entire main deck which seems to allow nature to flow uninterrupted. Starting at the pulpit the lines of this yacht are sharp like an Italian sports car. 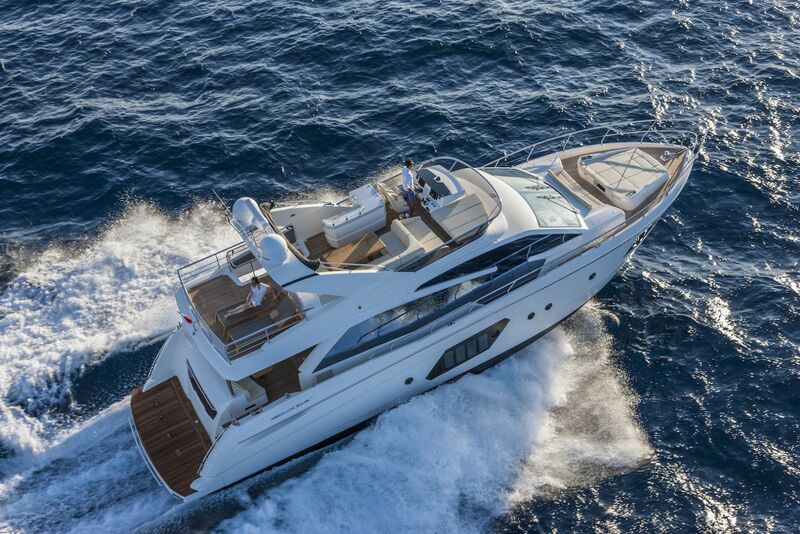 Dramatic entry angles and the slight sheer form a strong look from the bow. 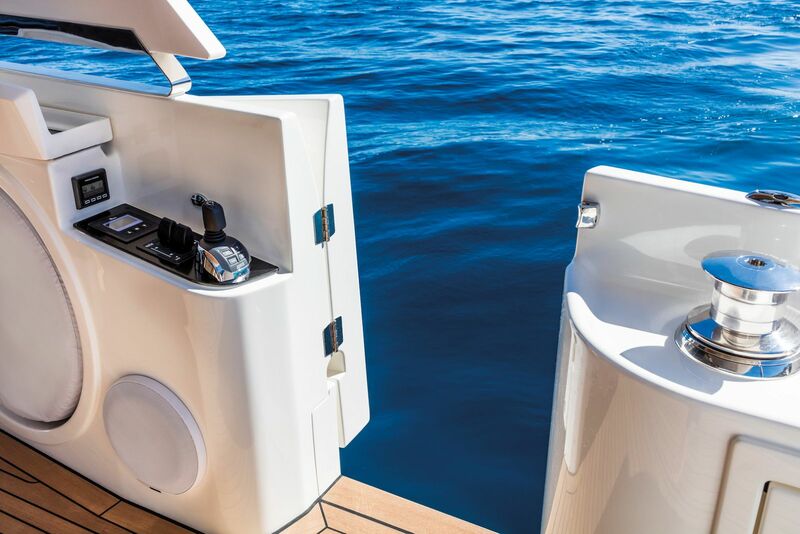 The bow is full of customizable amenities like height adjustable backrests on the sunpad, electric bow magnetized table which is also extensible, and an optional Mediterranean sunshade to allow just enough sun. 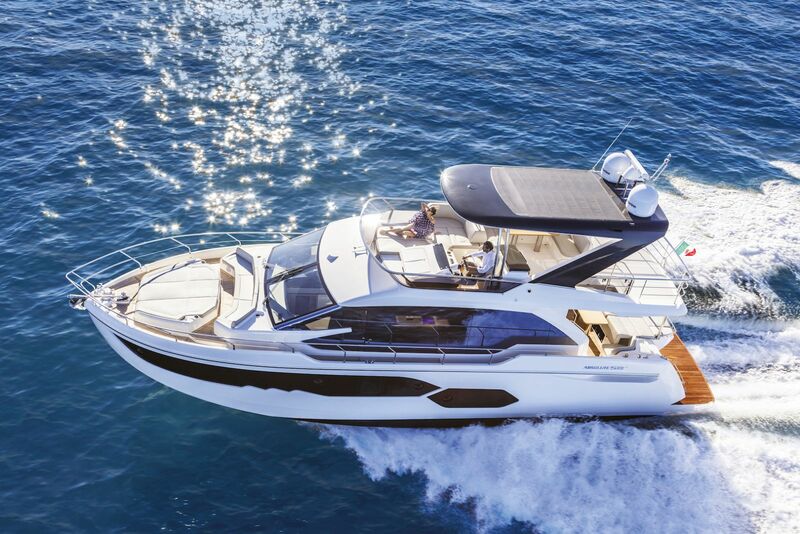 The Flybridge is also full of surprises starting with the two sets of entry steps, one from the main helm and the other from the cockpit. Once on the bridge there is an endless 470 square feet of teak with no steps. 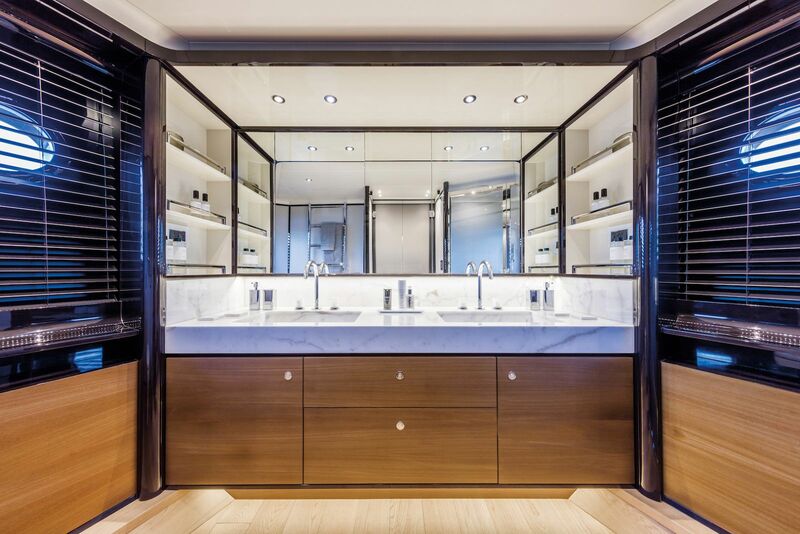 The supersized wet bar gives ample room for any of the imaginable cocktails and horderves. Sink, grill and shelfing galore make this as good of hang out spot as any. The dinette has an L-shaped couch and four individual chairs for a comfortable meal with up to 8 guests. 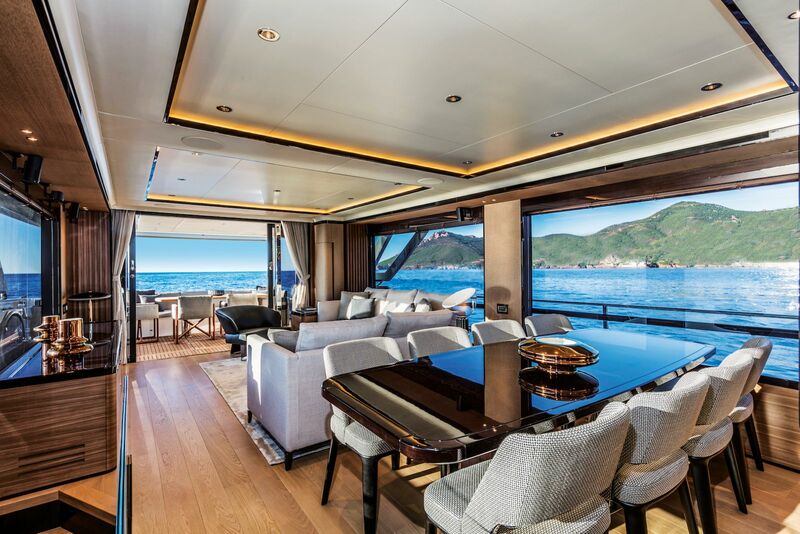 Another small wet bar counter separates this dinette from the ever-so comfortable couch conveniently placed mid ship on the starboard side adjacent some of the most astounding views to be had. 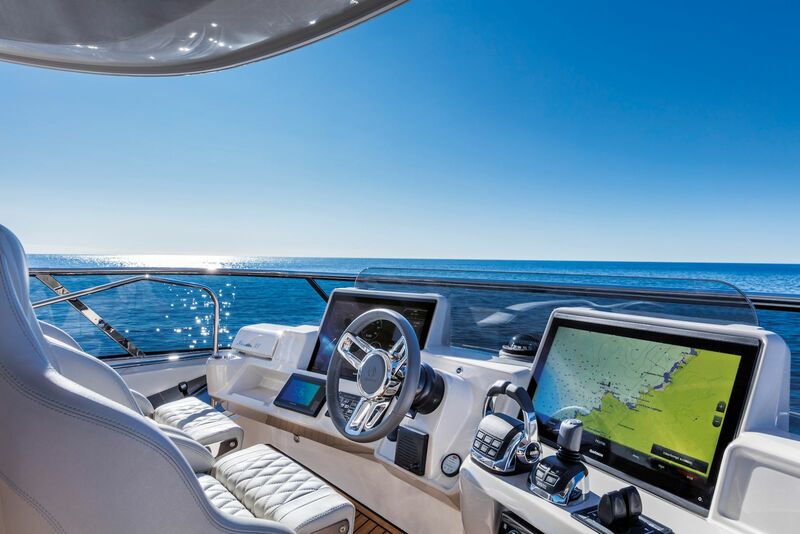 Two customizable and movable sun chairs typically stay aft on the bridge for the perfect rear facing ride. The XXL sunroof will allow the sun to pour over all of the guests. 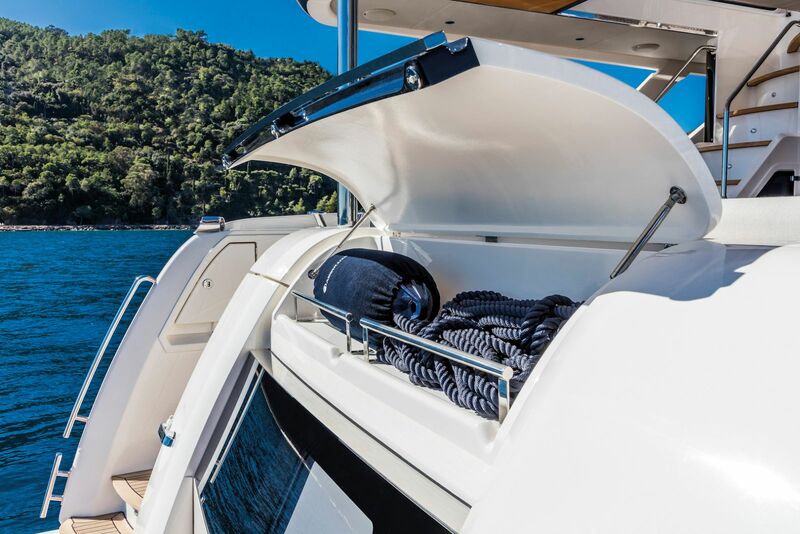 The helm on the flybridge is aesthetically pleasing and most importantly functional. 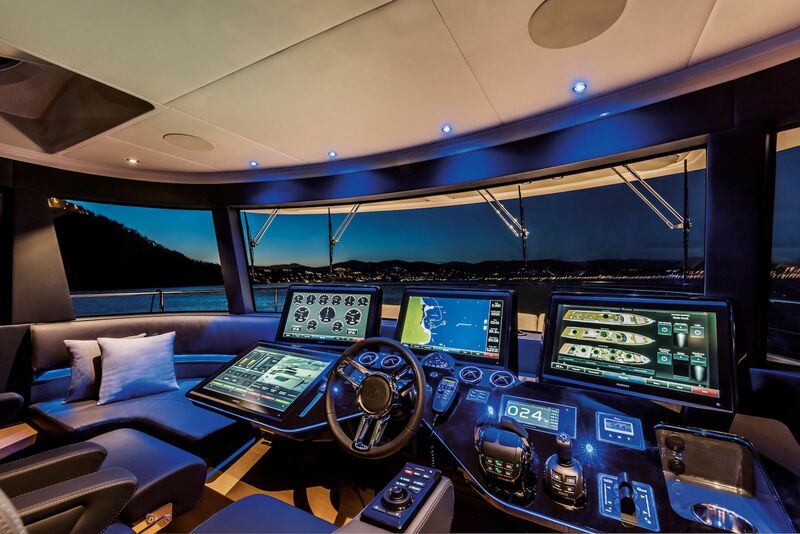 A dashboard that is ergonomic and customizable is what is found at the helm on the bridge of the Absolute 73 Navetta. Even the wind deflector is height-adjustable for maximum comfort. Snug feel at the helm is due to the luxury sports car feeling seats. 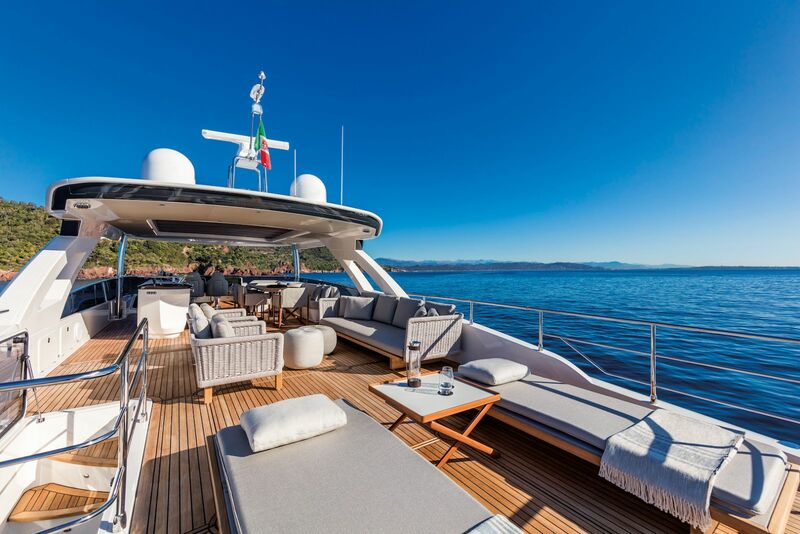 As elegance is at the heart of the Absolute 73 Navetta, it makes sense that the elegance is continued throughout the main deck. The massive windows, that are oh so beautiful from the outside, allow phenomenal views and natural light to escalate into the salon. A 360 degree view with cameras makes docking from the lower helm quite simple. 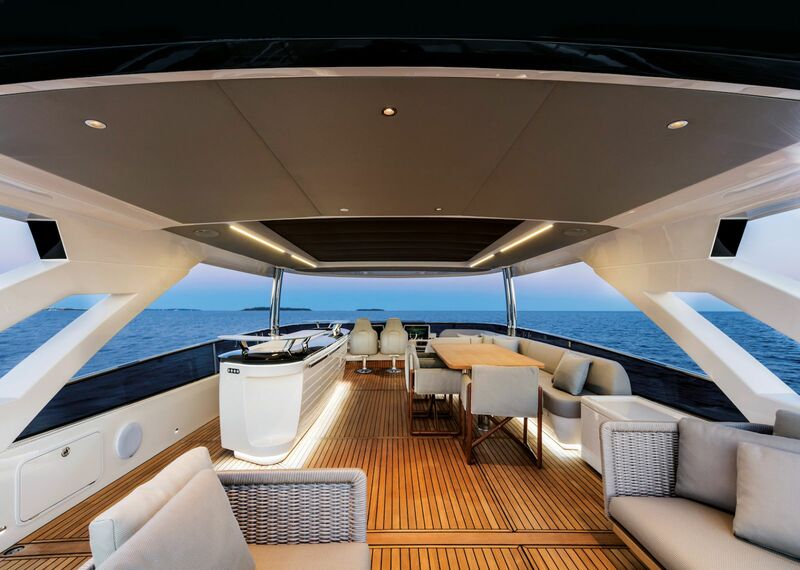 The lower helm inside the Absolute 73 Navetta may very well have been designed by space shuttle engineers because while sitting at the helm, behind the wheel, in an enclosed bridge, it is hard not to imagine a countdown to liftoff as the turbos spool up. There are nearly 10 displays to digitally monitor everything going on without the captain ever having to look more than 45 degrees away. The Volvo IPS Pod system has been finely tuned with the joystick so driving in close quarter is still fun. 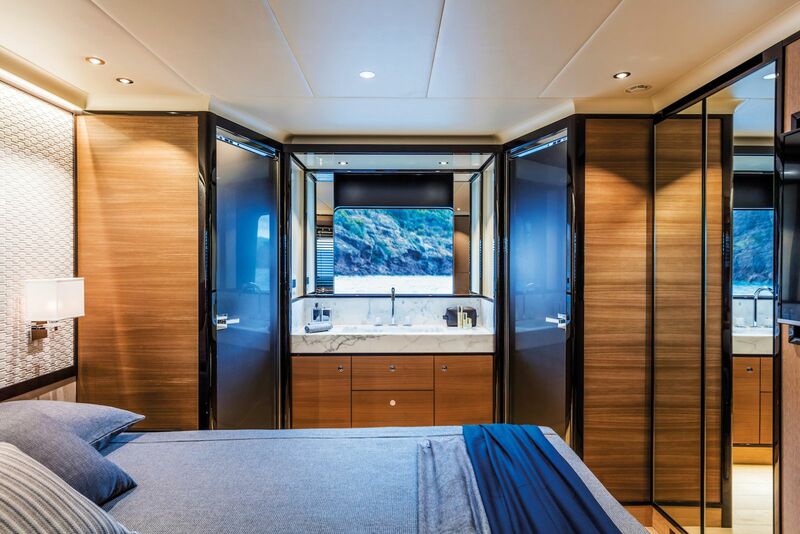 Sliding doors separate the galley from the salon, the salon from the entrance master stateroom and the galley from the lower helm. 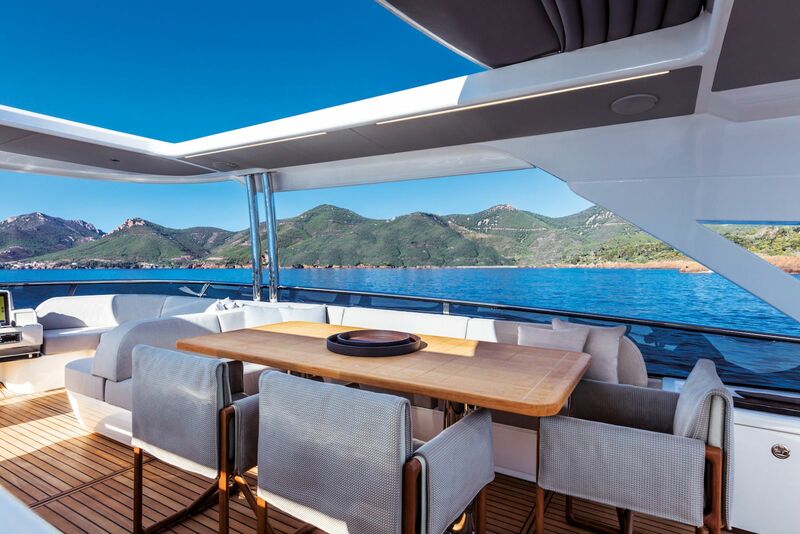 This adds to the overall massive feel of the 73 Navetta. The salon has multiple sets of customizable furniture so the limit is reflected by only imagination. A magnetized dining table will be a subject of conversation while enjoying a beautiful display of all the favorite dishes with up to eight friends and family members. 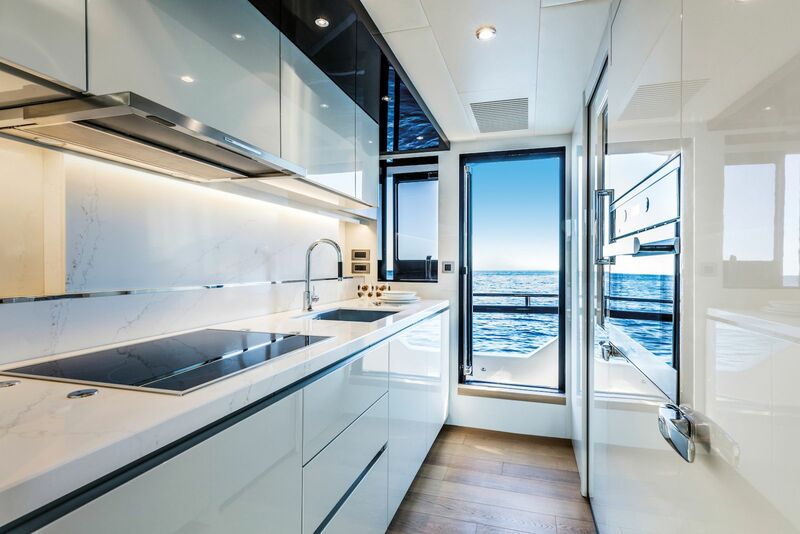 The galley on most yachts in this range, often times seems to be an afterthought but Absolute went above beyond the call to expectation with the galley on board the 73 Navetta. Being separated by just a sliding door adds intimacy to the salon while the chef is preparing in a full kitchen. 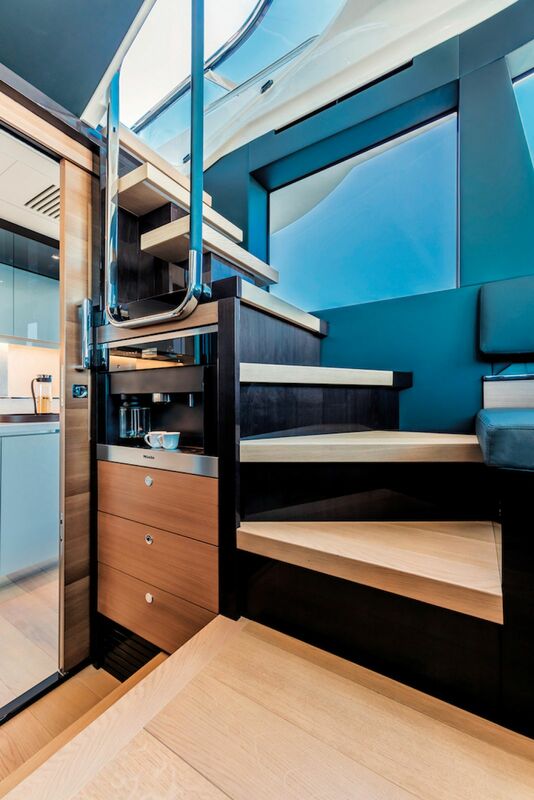 Access to the side walkways are easy through a door both in the galley on the port side and near the helm. Through the sliding door and down a few steps, oasis awaits. 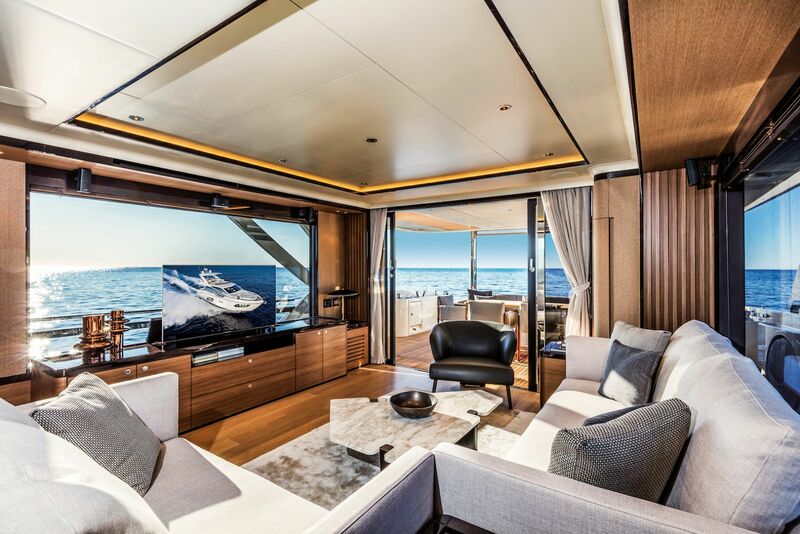 This private Master Stateroom has views and amenities that are found in the most expensive rooms on a cruise ship. 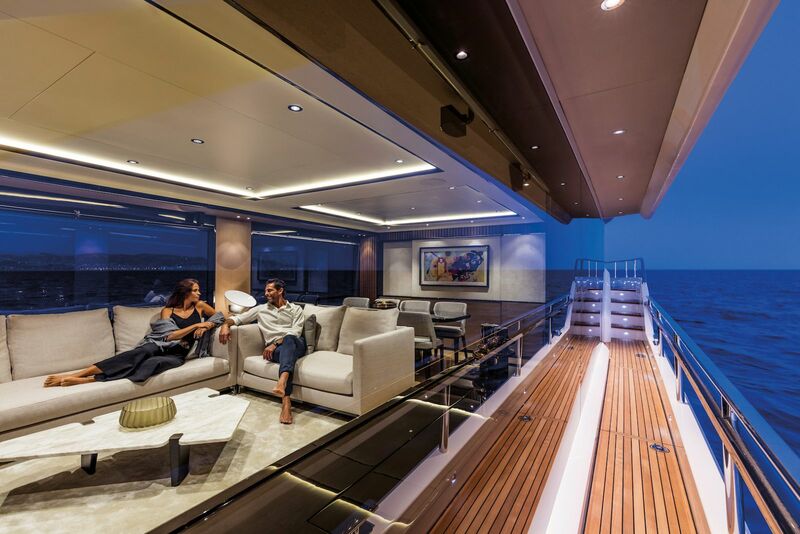 Being at the bow of the boat, the windows are extremely tall and even wider than that. 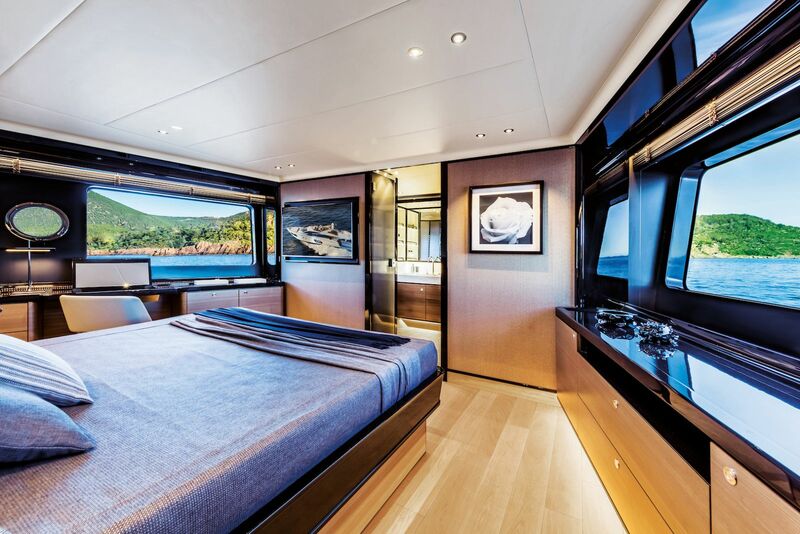 The real queen bed is not only long enough for tall boaters but is located in the center of this cabin for the best views out those enormous windows. Storage on both sides of the bed and a walk-in closet provide ample room for the entire wardrobe if needed. 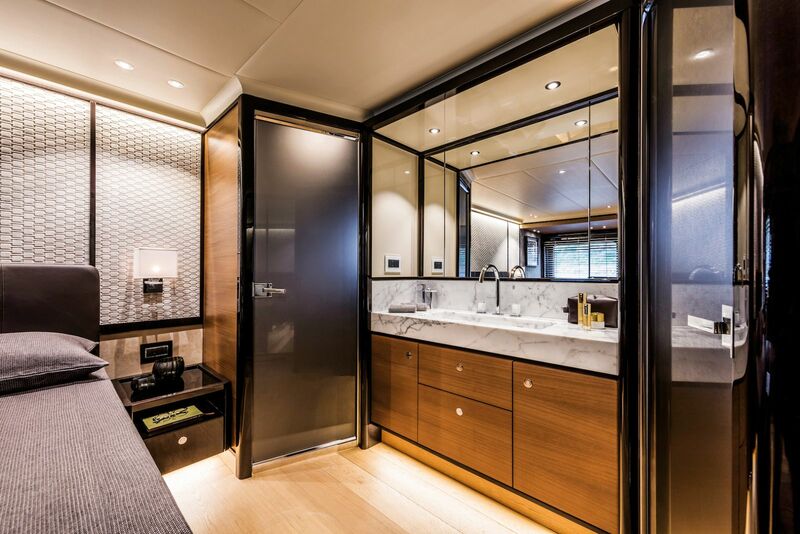 The private master head is an architectural feat in itself being at the forward most part of the bow while still allowing for a stand-up shower, his and her vanities, a toilet and a bidet. There won’t be a complaint from the guests who get to enjoy the VIP suite. 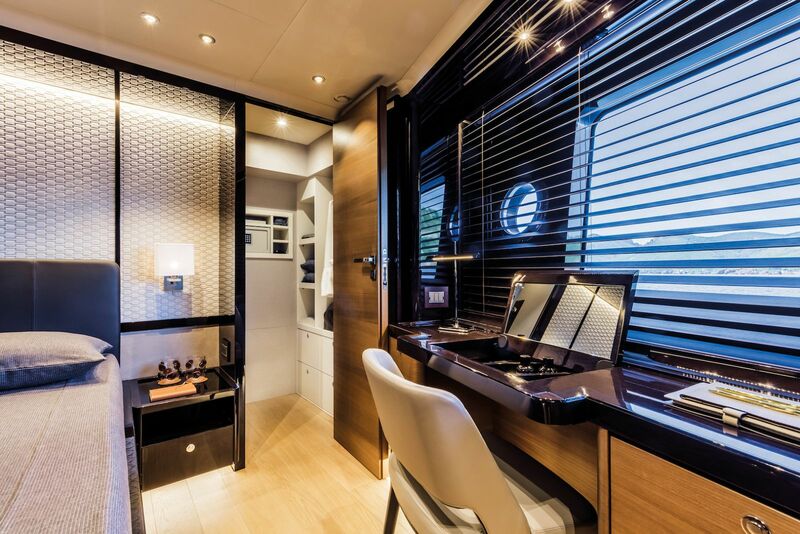 This mid ship cabin has near as much real-estate as the Master cabin with the head broken into three sections on the port side. The closet still gives plenty of room for a week’s worth of clothing. Up to four other guests are able to tag along for overnight hauls in the guest and mid-ship cabins. 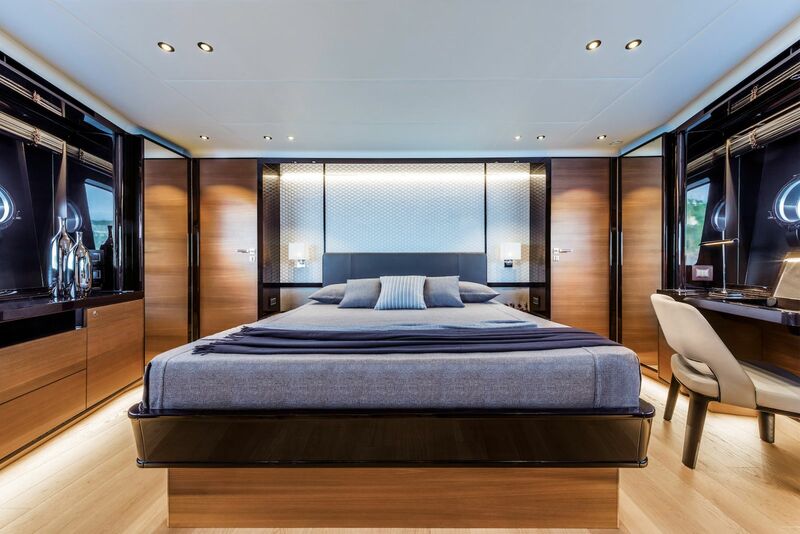 The guest is fitted with a full-sized bed where the mid-ship has two twins, perfect for the kids. 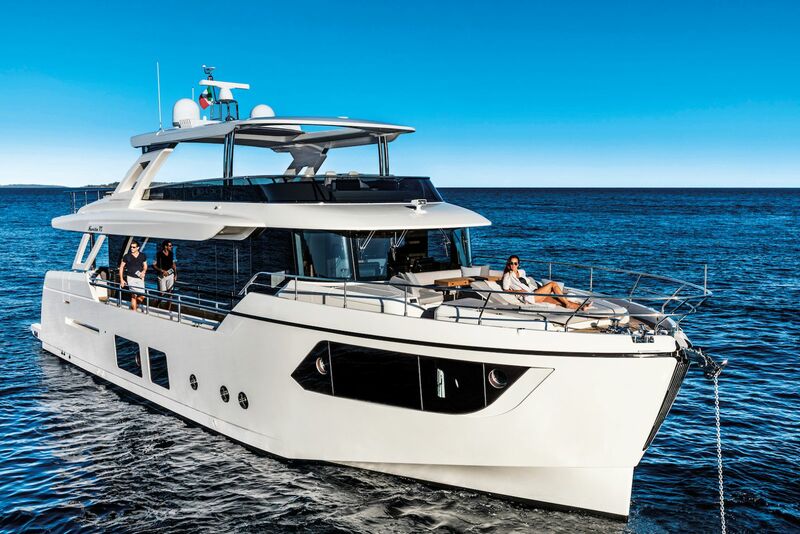 If you would like to learn more about the new Absolute Yachts 73 Navetta, please contact your Staten Island Yacht Sales Professional today. 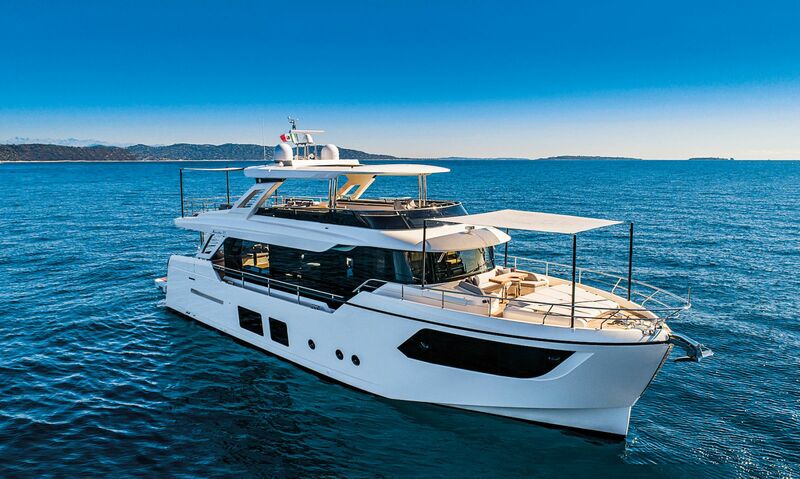 If there is a yacht that best personifies the blending of style and technology, it's the new Navetta 73 from Absolute. 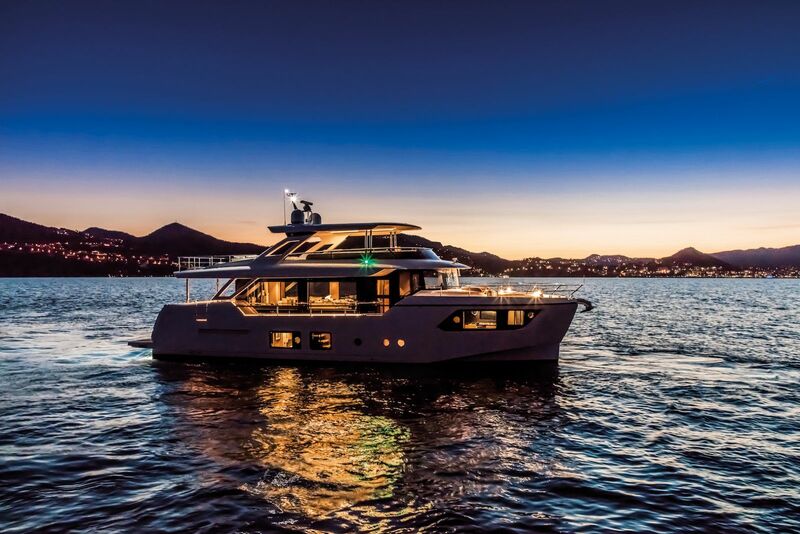 The Absolute Navetta 73 official video trailer displays her epic luxury and Italian style.